Mona Zhang, aka, hazelynut is both the founder of the Collegiate Starleague and a great good will ambassador for StarCraft II eSports scene. The Collegiate Starleague came from humble beginnings, originally spawning from hazelynut’s very own Broodwar club at Princeton. Now, the league boasts over 400 registered schools from across the globe who are all completing a chance at a $100,000 prize pool. There’s an entire staff of volunteers who work tirelessly to make a multi-national collegiate StarCraft II and League of Legends tournament a reality. Working in eSports takes a lot of energy… And you know what would be a good start to an eSports morning? Hazelynut is pretty darn healthy and she follows a strict diet and training regime. 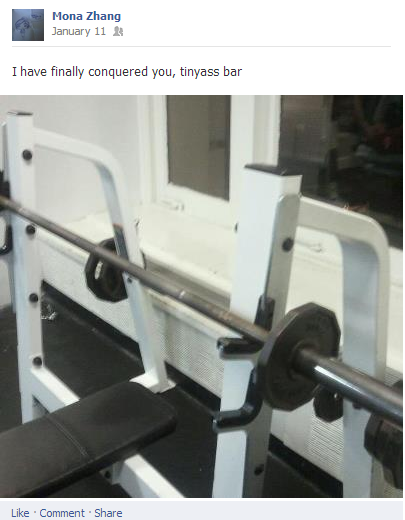 And bro, she lifts. DO YOU? She’s the one who introduced me to the paleo two-ingredient pancake recipe. The recipe is simple: 2 eggs and 1 banana. That’s it. Mix ’em together, pour them into a pan and you’re good to go. 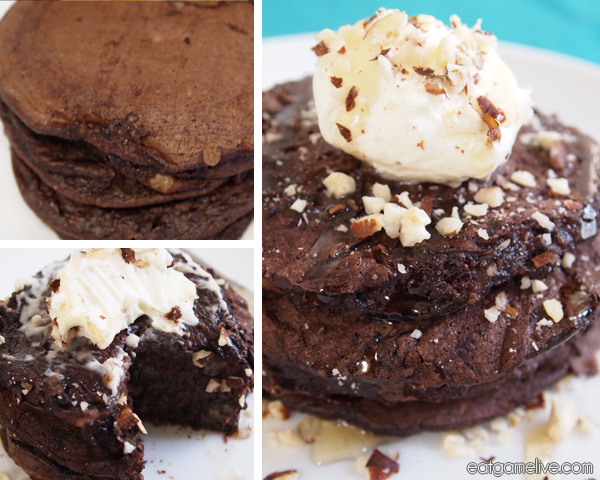 While paleo pancakes are tasty on their own, I didn’t think they’d fit the style of my blog. I like to experiment while still playing homage to classic techniques and flavors. So, I added chocolate. IT TURNED OUT PRETTY GOOD. This recipe works best if you use a non-stick skillet. If you don’t have a non-stick skillet, use a little bit of oil (preferably a coconut oil or butter) to keep the pancakes from sticking. You will need to clean the pan with a moist towel between each batch. Prep work for this will take about 10 minutes. Total cook time will be about 15 minutes (about 2 minutes per pancake), this will also depend on how large/how many pancakes you make. This recipe will make 2 servings. Mash banana in a large bowl using a fork. Combine your eggs and stir until the mixture has thoroughly combined. 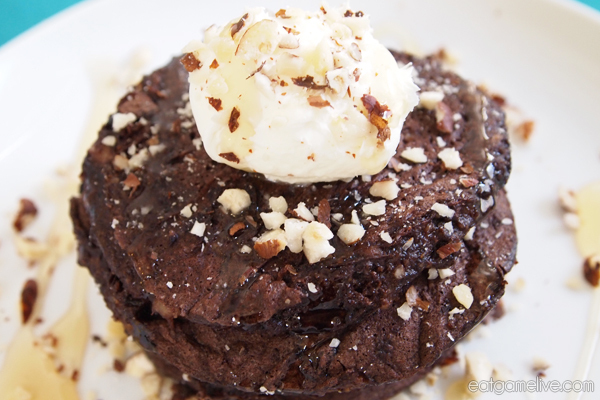 Add in your vanilla extract, chocolate powder, and flax seed. Stir to combine. If you find that your mixture is too thick, you may want to add a teaspoon of water (or milk) in order to thin it out. Set a skillet on low heat. Pour about a 1/4 of a cup of batter into the skillet. Cook pancake for about 45 seconds to 1 minute on each side (the pancakes will start to bubble). Remove pancakes from skillet as soon as they’re done. Plate pancakes and add a spoonful of mascarpone cheese. 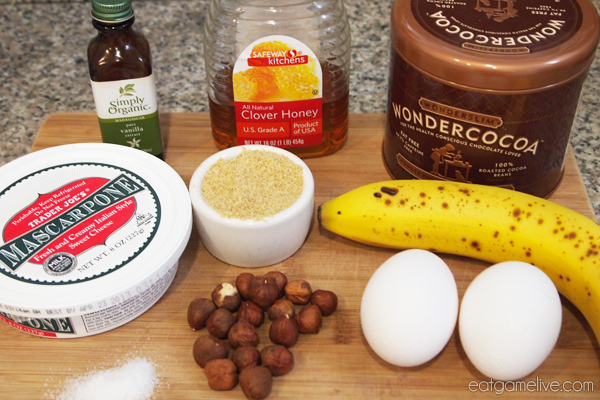 Drizzle honey and sprinkle hazelnuts over the pancakes. These things are delicious. I can’t stop eating them… Or taking photos of them apparently… So GG WP. 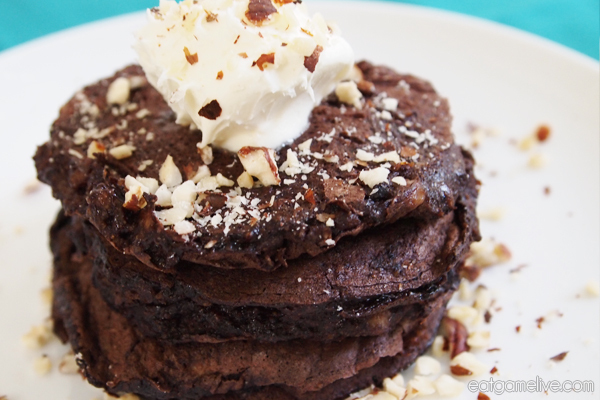 I will warn you that these pancakes basically taste like brownies. They’re dangerous, but not as fattening as you might think, so it’s a good choice if you’re craving something sweet. With that being said, try making these easy pancakes before the next Collegiate Starleague cast. What could I use in place of banana? I’m gluten-intolerant and allergic to bananas. Any ideas? You can try canned pumpkin puree. It has about the same consistency as mashed bananas, but is a little bit more watery. You can fix this by adding in more flax seed or using coconut flour.